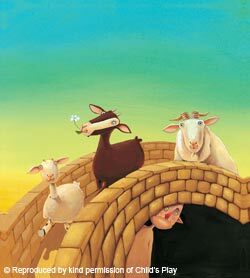 Read and enjoy together the story of the Three Billy Goats Gruff. Some traditional stories can be quite scary for young children. Therefore, we need to tell the stories in a warm and safe environment, supporting the children with our presence and reassurance, until we reach the happy ending. Scary monsters hiding under things may be especially worrying for small children, as this can translate into concerns about ‘unknowns’ under the bed at bedtime. Create a ‘Billy Goats Gruff area’, with a big, lovable troll that the children have made themselves to help reassure them (see activity 1). Place the troll near a safe bridge made from low equipment or beanbags, with a soft landing on to a ‘stream’ of fabric or carpet. The children will enjoy daring themselves into teasing their friendly troll, and putting themselves in control. Encourage them to play the part of the troll themselves, sitting under the bridge. Being chased and perhaps ‘caught’ by a troll who is just another child will provide a frisson of excitement, without real fears (see activity 2). The exciting refrains from the story will unite the children as they chant them during their play in the area (see activity 3). Three Billy Goats Gruff (Flip Up Fairy Tales series, Child’s Play) troll; large beanbags; blue fabric for a stream; large mats.